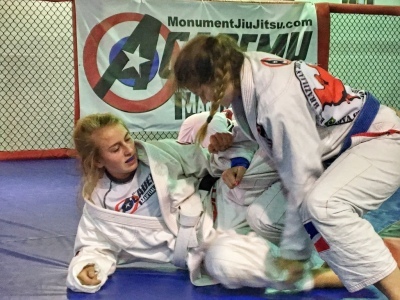 Brazilian Jiu-Jitsu is a martial art and combat sport that effectively teaches a smaller person how to defend his/herself against a larger adversary by using leverage and proper technique and is most famous for its ground fighting techniques. 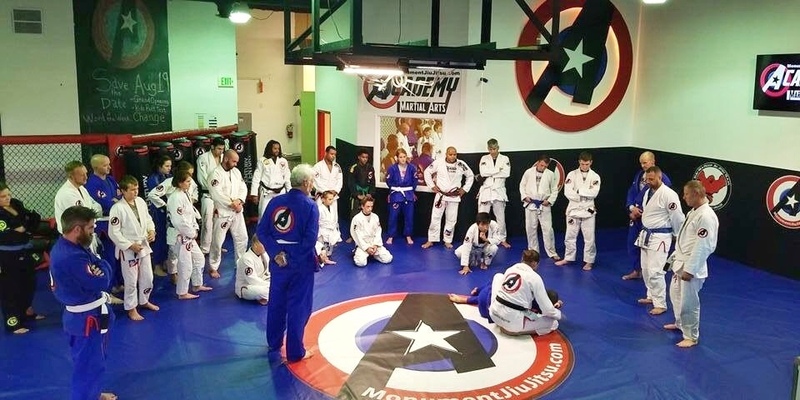 Brazilian Jiu-Jitsu may be the most effective self-defense martial art due to its practicioners being able to subdue and effectively control an attacker regardless of size. 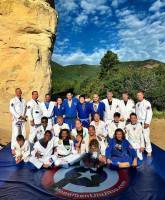 We also have the only Brazilian Jiu Jitsu school in Monument/ Tri-Lakes area taught by a BJJ Black Belt and is from the Carlson Gracie Jiu-Jitsu lineage. The UFC was originally started by the Gracie family to show it's superior effectiveness compared to other martial arts with Royce Gracie winning 3 of the first 4 UFCs despite being the smallest person in the tournament. This launched the popularity and global awareness of Brazilian Jiu-Jitsu (also known as BJJ). It is now used by all UFC fighters and is taught to law enforcement and military combatives. Regardless of its obvious utility in fighting, it is said to be "THE GENTLE ART" due to the practitioners ability to train hard against resisting opponents with limited risk of injury. We would love for you to come in and try a free class. We are a very welcoming, family friendly environment. Give us a call, leave your information, or just stop by, we'd love to have you join our team. Regardless of your fitness level, Jiu-Jitsu will help you achieve your goals. You do not have to “get in shape” to start Jiu-Jitsu!! That’s our job and we’ll take you there. Have you ever considered training martial arts, but thought "I'm too ... out of shape, old, small, etc." or "I don't have time." Men, women, and children have excelled in our program. You can be short, tall, thin, big – it doesn’t matter. Our instructor will help you develop a style that works best for you. It’s never too late to start training. The average age of our adult program is about 27 years old, with many students over age 40 and several over 50. Absolutely no experience is required to begin your training. The best time to start martial arts is as a child, and the second best time is now. You have never done a day of exercise in your life? No problem! You do not have to be in shape to begin training at our academy – most people who begin are not. At The Academy of Martial Arts, our instructor has years of specialized training in physical fitness, along with their martial arts expertise, and will develop a program that will work for you. We have helped many students lose weight and get into shape. Our system of martial arts and self-defense has been proven time and time again by our instructor and students. Our instructor has utilized these techniques in the cage and in the ring – at the national and international level in Brazilian Jiu-Jitsu (BJJ), Taekwondo, Kickboxing, and MMA. The difference between joining The Academy and other gyms is that with us, you know that the techniques we are teaching you work. We all make time for what is important to us. We offer multiple classes morning and evenings to fit your schedule. Your children follow your lead. 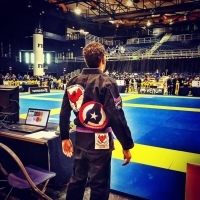 Other sports can give you great skills in teamwork, physical fitness, etc, but nothing compares to martial arts in the depth of personal development. Also as adults, we all get caught up in our daily routines. The average person watches 2-3 hours of TV per day. The average adult over 40 is also on blood pressure or cholesterol medication and at risk for diabetes in America. We have a very family friendly training atmosphere with no ego or intimidation. We make sure that all of our instructors, staff, and students are helpful, friendly, and fun to be around. You will love the community that we have here. Visit us or call to register for a Free Trial Class today. Call today to set up your first FREE lesson.